The dubio-engine – Accellerate your (self-) awareness! As a true doubtaholic, I constantly strive for more awareness of myself, and of others around me. In doing that, I find it helpful to ‘stretch’ my thinking a little bit by asking myself less-usual questions, like “How much am I?” (see post with the same title). After a while it becomes harder and harder to come up with new questions, so I decided to come up with an ‘engine’ to help me generate more, and more extraordinary, questions related to the what, how, and why of what keeps me busy. Select a subject (who?) First select the subject of your awareness. Are you focusing on yourself, your team (we), or a specific stakeholder of the organisation that you work in (they). To really ‘unusualise’ your questions, start with ‘unknown’ or ‘nobody’. Select a primary doubt (what, how, why?) Secondly, choose your primary question. Would you like to focus your attention on actions or choices (what? ), behaviours or methods (how?) or motives or values (why?). Now try to formulate a question using your selections on the three abovementioned steps. You can use the examples above to get an idea. For example, if I choose “customer > why? 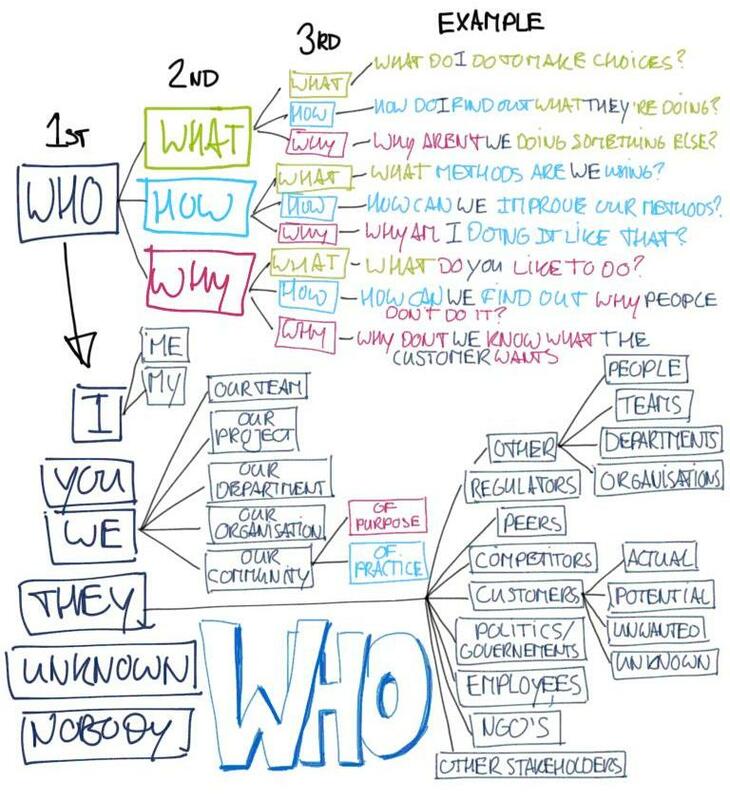 > why?”, I could end up with a question like “Why don’t we know what the customer wants?” (see above image). By doing this exercise, and by trying to answer the questions I find, I get to new insights that can help me (start to) become (even) better at what I do. Q: Dear readers, what do you think, could this help you become more (self-) aware? Any suggestions or doubts? From → Awareness, How?, What?, Why? I realise now I should add two steps: One for determining a verb (e.g. have, do or think), and one for adding secondary questions (e.g. when, where, how much). I’m reminded of the SMART objective methodology…. hmmm…. matter to be actually one thing that I think I might never understand. « What does strategic doubting look like?